Sri Devaadi Raja Perumal, or Thiruvazhunthoor, is a Hindu temple situated in Thiruvazhunthoor, Therazhundur, a village in Tanjore district of Tamil Nadu. It lies in between Mayavaram junction and Kuttalam railway station on the main railway line between Chennai (Madras) and Tanjore. 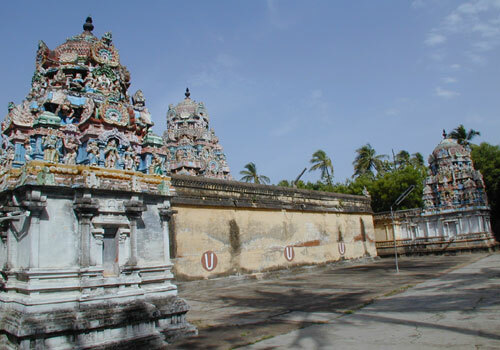 It is one of the "Divya Desams", the 108 temples of Vishnu revered by the 12 poet saints, or Alwars.This Divyadesam is also called with other names such as Azhundoor, Azhundhai, Therazhunthur. Uparisaravasu was the king of Sethi Kingdom and was the student of Devaguru Bhragaspathi. He got a chariot which floated in the sky from Lord Indra.Once he settled a dispute between the rishi's and devas and favour it in the Deva's side.The rishi's got angry and cursed the king that his chariot would not fly in the sky. So as an effect to the curse, his chariot got stuck in this place and the king fell infront of the lord. Henceforth this place is called as Therazhunthur (There means Chariot). Lord Narayana sent Garudan and helped him to fly back. As Lord helped the person loved by deva's who was a human he was called Devaadirajan from then on. Moolavar Devaadirajan is of 10 feet tall having Lord Gauruda to his left and prahalatha along with Markanteya Maharishi to his right. He has Gadhayudham (his weapon) in his left hand. River Cauvery too is there kneeling at his lotus feet. Therezhundur is one the 108 holy shrines of Vishnu temples in Tamilnadu. Only in this shrine Thirumangai Azhwar praises both the Lord and the Mother together in his Mangalasasanam hymns. Lord Perumal and Lord Shiva were playing dais one day. Mother Parvathi was the judge. While rolling the dais confusion arose. Mother Parvathi favoured Perumal. Angry Shiva cursed Her to become a cow. Mothers Mahalakshmi and Saraswathi also joined Her as cows. Perumal became the shepherd. Aa in Tamil means cow. 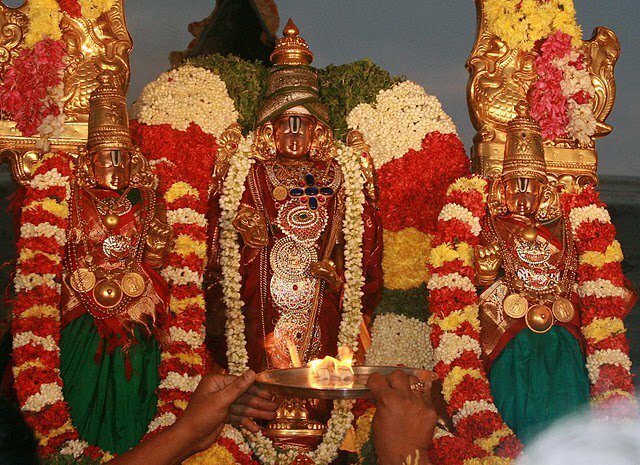 Hence Lord is also praised as Aamaruviappan ruling this region. 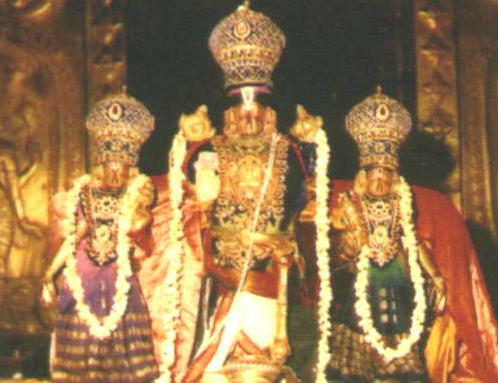 Therazhandur Sri Aamaruviappan Divyadesam is one of the Krishnaranya Kshetrams located 11 KM form Mayiladuthurai, called also as Mayavaram. A tall and fabulous 12 feet Lord Devadhi Rajan is blessing along with Prahaladhan on HIS Right Side can be worshiped along with Periya Thiruvadi Garudalwar on his Left Side. The other Krishnaranya Kshetrams are Thirukannamangai, Thirukavithalam ( Kabisthalam ), Thirukannapuram and Thirukannangudi. This is the One and Only Krishnaranya Kshetram where the almighty blessing with a Cow and a Calf as HE blesses in Gokulam. Once Brahma wanted to worship the almighty as Krishnan here. Hence he went to Gokulam, took all the Cows and Calves in Gokulam to Therazhandur by assuming that Lord Krishnan will come down to Therazhandur to take back his Cows and Calves so that he can have his Darshan as Lord Krishnan. There's a beautiful unjal Mandapam (Unjal - Joola - Swing) in this temple. Inside the Rajagopuram, poet kamban and his wives images are beautifully carved. (Poet Kamban was born here only) there are also many beautiful images which are in a demolished state. Manavala Maamunigal has done Mangalasasanam to his place. Utsavar is brought for Thirumanjanam (ceremony of bathing the lord) in river cauvery many times each year.As an act of Unison, Lord Krishna (ie) Lord Aamaruviappan is dressed up as Lord Rama and brought in Ceremony near the Vedapuriswarar temple (Lord Shiva's temple). The temple is open from 7.30 a.m. to 12.00 a.m. and 5.00 p.m. to 8.30 p.m.
Ashtabujakaram Perumal Temple, Kanchipuram, TamilN..